In today's news, a Chinese man attempted to sneak his beloved pet turtle onto a flight from Guangzhou to Bejing. The turtle was concealed within a KFC hamburger. While this may seem like a genius idea, like the above picture suggests, the man and his burger (lettuce, tomato, pickle, reptile, hold the ketchup) were quickly noticed by security. The passenger tried to insist that nothing was wrong. As Li passed through airport security, X-ray screening machines detected a few “odd protrusions” sticking out of a KFC burger that the man had packed in his bag. Airport staff determined that the protrusions looked suspiciously like turtle limbs, and asked to inspect Li’s luggage. 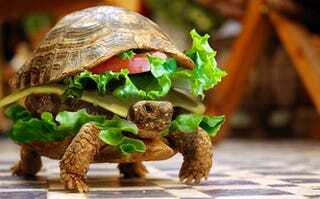 Eventually it was discovered that the burger did, in fact, contain a turtle. When asked why he had devised this strange idea, Li said that he had only wanted to travel together with his “beloved” turtle. After staff patiently explained that turtles could not be smuggled on board the plane, Li reluctantly agreed to allow a friend to care for his pet while he was away. This may top the list of weirdest ways people have attempted to smuggle animals onto planes. At least they made sure the turtle had a place to go before the man could travel. I mean, that seems like a really lousy day for the turtle. Placed in a hamburger and then x-rayed? Yeesh. I hope he got to munch on some nice non-KFC burger lettuce when he got to the friend's house.